EVERYTHING! it was amazing. Quiet, romantic, yet right in the busy area with all the shops and wonderful restaurants. We would definitely come back here! Everything!!!! It was just superb!!!! Enjoyed it so much we didn't want to leave. From the moment we were met and led to the property, till the moment we left, this was just perfect. The location was exactly what we wanted. We had a view of the ocean from our unit, and a few of the sunset from the patio. Nicholas, George and the entire staff were very friendly. We really got to know them. The room had just been remodeled last winter, and was truly spectacular. It was spotless. Can’t recommend this enough! Aeifos was a lovely spot at the very north end of Oia. The view from the hotel is nothing short of spectacular! Maroula - and especially Nikolas were amazingly helpful in arranging all things Santorini including dinner suggestions/reservations, sailing cruises, and ground transportation arrangements. I would definitely recommend this property. We really liked the breakfast as well as the help from the staff for all our needs. This was an astonishingly good location in Oia near the castle, but which was also a haven of quiet, away from the crowded streets. We were in the King suite for 2 and loved the extra patio space looking over the caldera. The staff were exceptionally helpful and arranged airport transfers and a caldera boat trip making everything easy. The property photos on here are also accurate - book with confidence! AMAZING view!!!!!! Very quiet even though it was in the heart of town. Location was fantastic, close to all the restaurants and shops plus the world famous sunsets. Nick, one of the staff, was very helpful! 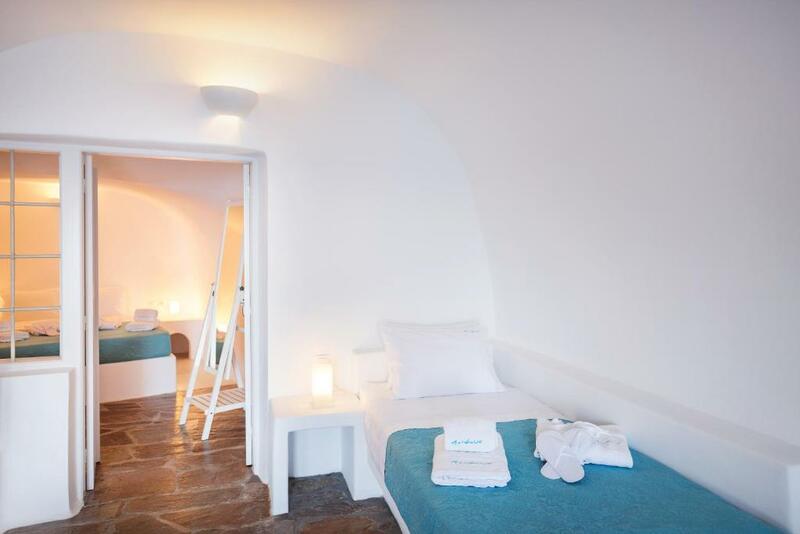 This place is exactly what you have in mind when you imagine a romantic stay in Oia. Even though you are so close to the castle: 2 minutes walk to the sunset favorite view point and to the marble street, you don't hear a sound when you sit in your balcony enjoying the Caldera view. If you are here in Full moon don't forget to come back to your private balcony right after sunset to watch the moonrise over the waters. Nikolas was very helpful and fun to be around, we felt personally taken care of. Maroula answered all my inquiries through email promptly. We loved staying there. Excellent location with an excellent view. Friendly staff. Lock in a great price for Aeifos – rated 9.2 by recent guests! 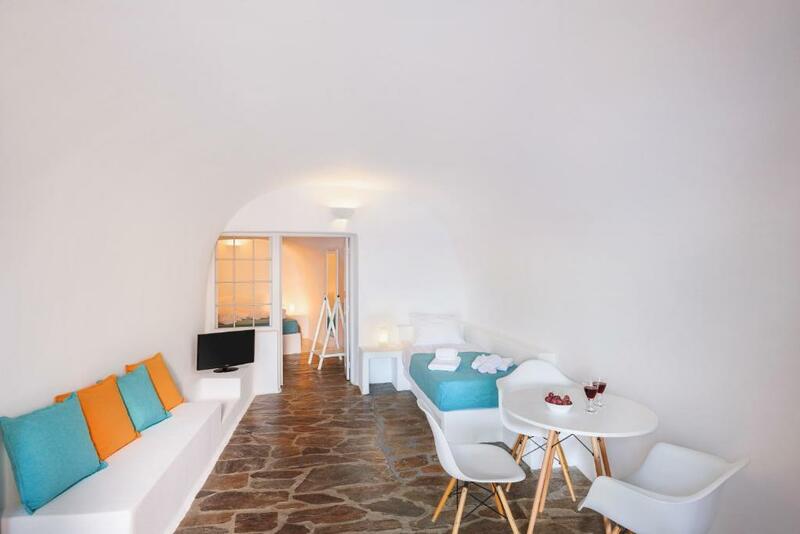 One of our top picks in Oia.Offering panoramic views of the Aegean Sea and Caldera, Aeifos is located in the scenic village of Oia, just 20 feet from the famous castle. It consists of suites blending the local architecture with modern facilities. 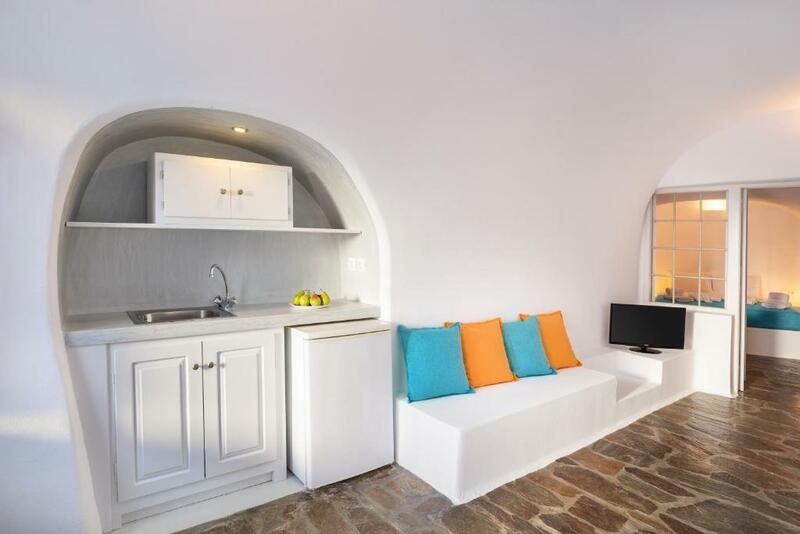 Fitted with vaulted ceilings and stone floors, all units at Aeifos open to a furnished terrace. Each suite has a mini fridge, a flat-screen TV and air conditioning. 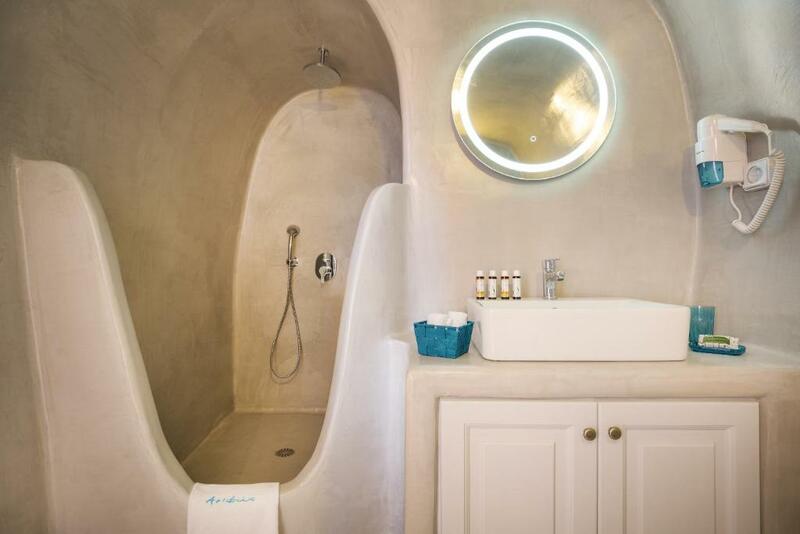 Free toiletries, slippers and a built-in shower are available in the bathroom. Upon arrival, guests are offered a bottle of traditional wine and a fruit basket. Restaurants, cafés and a mini market can be found within 350 feet from Aeifos. Athinios Port is at a distance of 12 mi and Snatorini Airport is 9.9 mi away. The lively town of Fira can be reached in 6.8 mi. Free WiFi is provided. When would you like to stay at Aeifos? 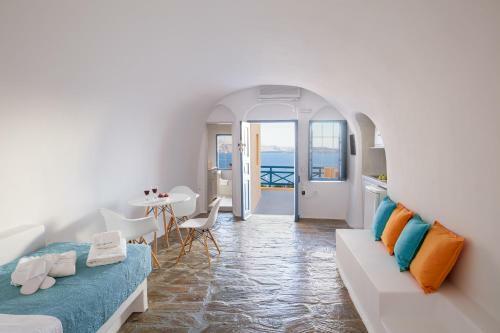 Offering panoramic sea and Caldera views from its furnished terrace, this cave-style suite comes with built-in beds and stone floors. It features a flat-screen TV and free WiFi. 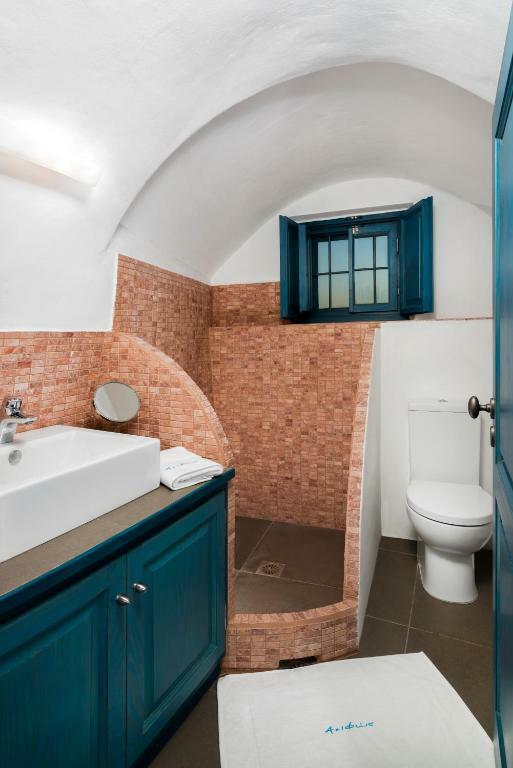 Free toiletries, slippers and a built-in shower are available in the bathroom. Please note that this suite is located on the upper level and has a private entrance. Offering panoramic sea and Caldera views from its furnished terrace, this cave-style studio comes with built-in bed and stone floors. It features a flat-screen TV and free WiFi. Free toiletries, slippers and a built-in shower are available in the bathroom. Offering panoramic sea and Caldera views from its furnished terrace, this cave-style suite comes with built-in beds, a wooden loft with a single bed and stone floors. It features a flat-screen TV and free WiFi. Free toiletries, slippers and a built-in shower are available in the bathroom. Offering panoramic sea and Caldera views from its furnished terrace, this residence comes with a wooden loft, a fully-equipped kitchen, a dining area and a living room. It features a flat-screen TV and free WiFi. Free toiletries and slippers are available in the bathroom. Aeifos is a traditional complex, according to the special characteristics of the Traditional Architecture of Oia. We desire to keep all the characteristics without altering the initial form. All the renovations and improvements in the interior of the houses are made with respect to its initial structure and function. This way, are combined the experience of living in a traditional cavehouse, with all the comforts of a modern hotel. 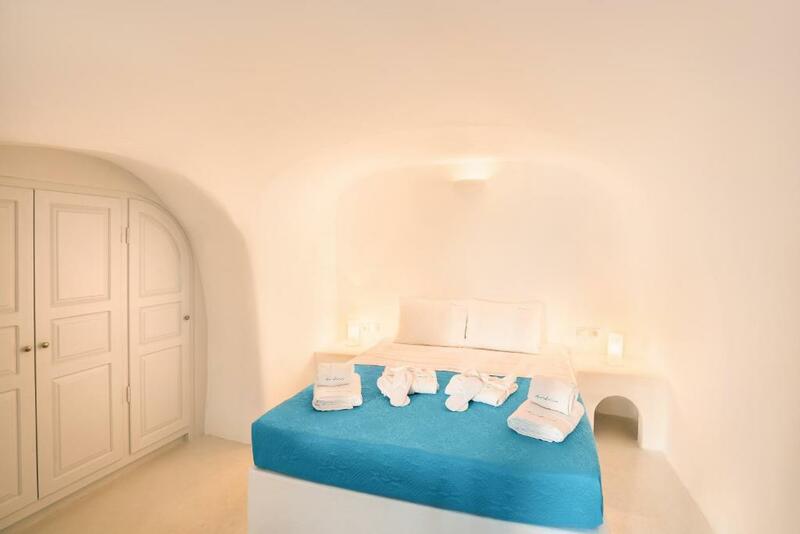 The built beds are combined with luxurious mattresses and textiles; the minimal decoration is integrated with the modern, wooden furniture, the built baths of traditional shape made with modern materials. The most important for us, is our intention to feel the visitor comfortably hosted with all the characteristics of the Greek hospitality. We welcome you with local Vinsanto wine and with the exclusively Greek products of our breakfast. The personnel of the hotel is always on your disposal to help you and to make your stay comfort and pleasant. We try to offer to our visitors everything we have promised in order to feel like home! Our hotel is located next to the Castle of Oia, on the Caldera, with its entrance in the central pedestrian street of Oia. This is the area of the island where all the travelers want to visit in order to enjoy the well-known sunset. Our visitors have the privilege to enjoy the sunset from the terrace of our hotel. 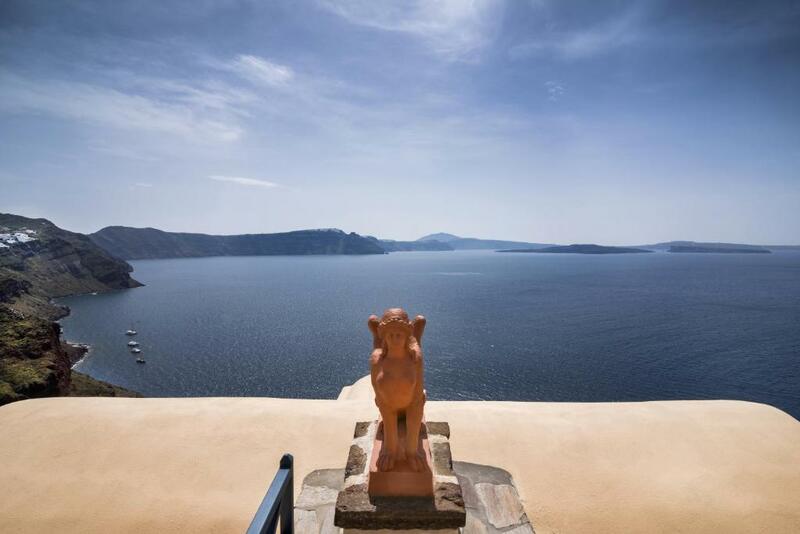 At the same time, our hotel offers the privacy and calmness needed to enjoy at any time the view to Caldera from your own private terrace or the communal yard. House Rules Aeifos takes special requests – add in the next step! Aeifos accepts these cards and reserves the right to temporarily hold an amount prior to arrival. Please note that for safety reasons, only children over 6 years old can be accommodated in Aeifos. Kindly note that in order to reach the property guests will have to climb 40 stairs, therefore the property is not suitable for guests with mobility issues. Please inform Aeifos of your expected arrival time in advance. You can use the Special Requests box when booking, or contact the property directly using the contact details in your confirmation. Location is just perfect. its right next to the castle. view is speechless. absolutely fantastic! The view from my room was sensational, can’t wait to visit here again! Being the most westerly hotel in Oia, right next to Oia ruins means that come every sunset it gets very busy and quite noisy from all the people jostling, and sometimes shouting at eat other. Breakfast is a simple affair - wasn't something that we didn't like. People just need to note that it's quite basic; orange juice, greek yoghurt, jams and fruits, coffee, fresh milk, toast and muffins. Caldera view, private balcony, amazing service from Nicholas and not at an ultra premium Santorini price! Would definitely stay again. The photos do not do the hotel justice. The room and balcony both massively exceeded expectations. The stairs going down to our hotel should be improved, especially during the turns. Ropes should be provided during those turns. Also, please improve the variety of your breakfast. Your staff, Nicholas tho was so kind when he provided us with cereals, which we requested for. The view from our room was to die for. It was spectacular. We both had the best sunrise view and the best sunset view is just a few steps away. Your staff were amazing. Nicholas was such a great help. The room was always clean. Breakfast consisted of a loaf of bread, butter, honey, jam and yogurt which wasn't very filling but we must be clear, this isn't a deal breaker for us. Aeifos was a wonderful place to stay - perfectly located. Our room was spacious, very clean and comfortable - the view from our room was amazing. We would come back in a heartbeat. The location is perfect, room and terrace setup very cosy and tasteful. Perfectly quiet even on busy periods. Staff very polite and helpful. The location is great, the room was amazing, the staff were incredible and on top of it we had kittens that visited us which was magical! We stayed there for our anniversary and everything was perfect. We would like to thank Nicholas who was super friendly and an amazing host, he chatted with us everyday and helped us when we arrived and when we left. He is definitely an asset to the hotel. The hotel and the staff working at the hotel was simply amazing and so helpful! They have organized our transfers both ways, carried all of our 3 heavy suitcases, booked the best tables at the best restaurants for the sunset view and overall made our stay in Santorini absolutely perfect!!! Highly recommend this place! Nicholas gave us an amazing service ! !